Westfield again today. Important gift buying mission. 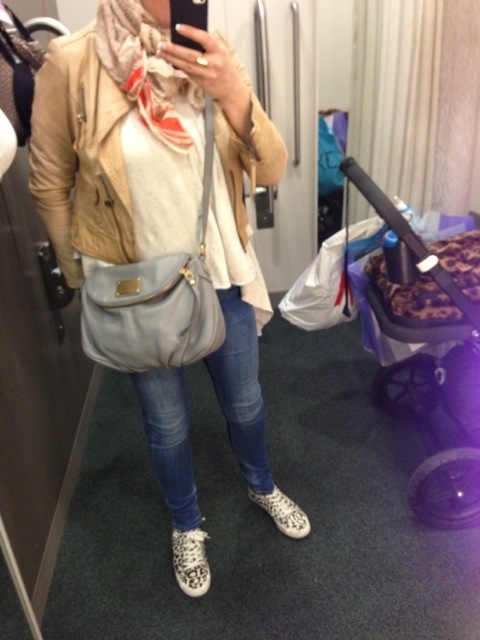 I wore Zara skinny jeans, Mint Velvet caramel leather jacket, old cream snake print and orange scarf, Zara studded zebra trainers and All Saints cream Nep top, Marc by Marc Jacobs grey bag. 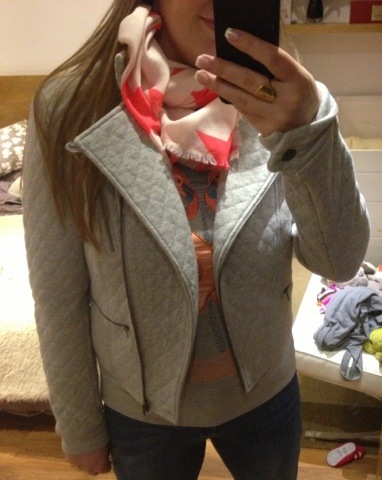 I wouldn’t have thought to wear this jacket just yet, I usually wait for warmer spring. However it fell off a hanger and I threw on in a chair until I had to time to find space for it again. 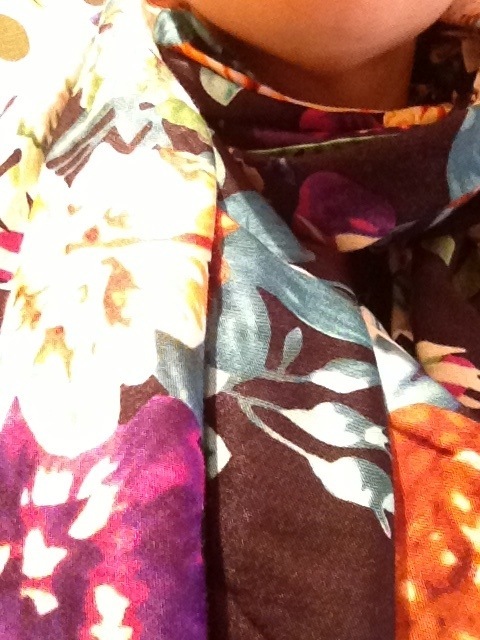 On the chair was the scarf (my eldest always sleeps with one of my scarves) It made me think spring is on the way, which made me smile, hence it’s early outing. This evening I am going out to the pub for an hour once the babies are in bed. 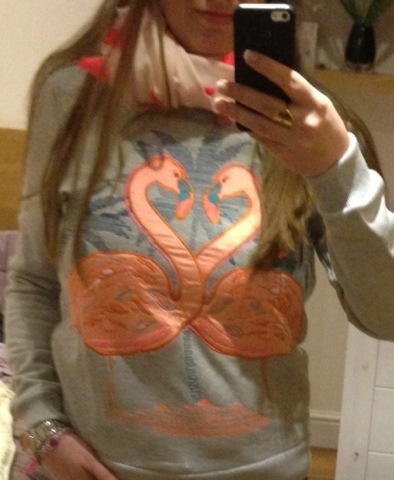 I’m wearing Zara skinnies still with a H&M flamingo sweatshirt, grey Next quilted biker jacket, Topshop Vectra studded slippers and H&M neon star scarf. The sweatshirt is in store now but size up – it’s tight! This entry was posted in Outfits and tagged All Saints, H&M, Marc by Marc Jacobs, Mint Velvet, Westfield, Zara on March 5, 2013 by Eve WornOut. Today we went to Westfield. I always start in the wonderful Grind on the ground floor. 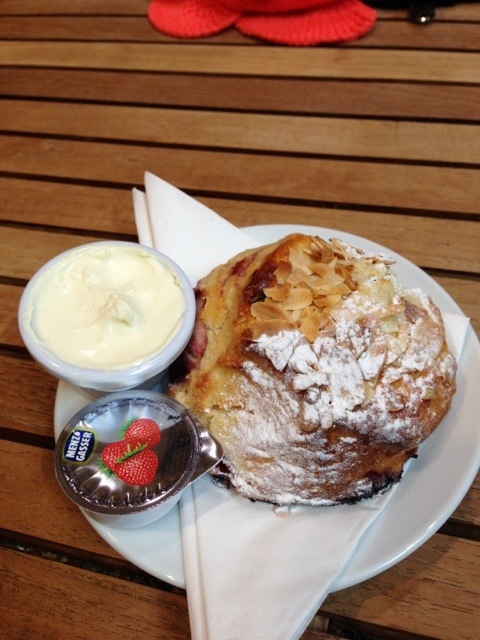 Their cakes and savouries are so tasty and they make really good coffee (sadly I don’t say that about many places) Today I scoffed down this cherry and almond scone. Heavenly. I could barely resist buying up half of the kid’s section in John Lewis. Some beautiful vibrant prints. Finding their Kin kid’s range was wonderful! I think it is new and I don’t know much about it but I saw stylish, affordable clothes for kids and my heart sang. I showed my gratitude by making several purchases. The blue and white smock and dress are really cool in real life and the grey and orange dress is already one of my favourite things my daughter has ever had. I adore it. I was excited to look at the women’s version on line when I came home but I think it’s far less stylish than the kid’s range. There is a nice orange silk tee that may tempt me though and it’s definitely a brand I shall be keeping an eye on. I went into Zara to take some things back and as I walked in the door my eyes settled on these. I have spent winter resisting the leopard version. This was just too much. 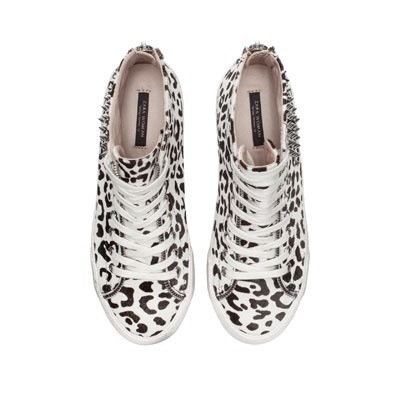 I will be able to indulge my passion for animal print, studding and trainers all at the same time as well as nodding towards the monochrome trend. Happy Mama! I wore a comfortable outfit. 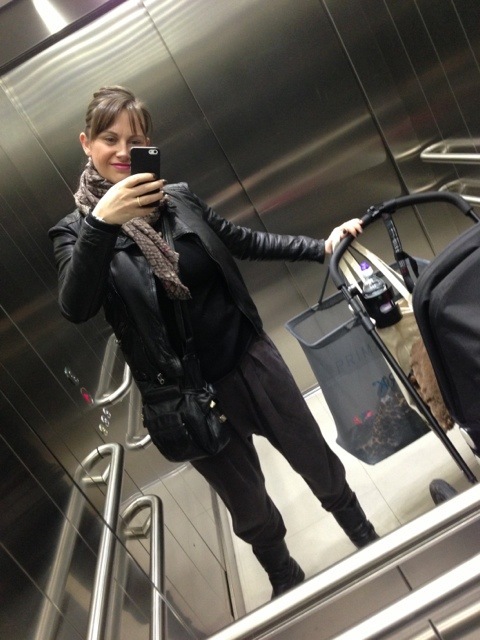 Zara plum harems, Belstaff bikers, J Crew cashmere long sleeve tee, Zara leather jacket, Marc by Marc Jacobs dragon scarf, Nars Schiap lipstick, See by Chloe bag, Primark shopping basket. This entry was posted in Outfits and tagged John Lewis, Primark, See by Chloe, Westfield, Zara on February 15, 2013 by Eve WornOut. This weekend, we went Santa spotting. The first place we went was Westfield in White City, where the staff were charming and the experience was great – they incorporated the childrens’ photos into a 3D movie, and then ushered them into a quiet room with Santa. The second place was the local primary school Christmas fair. It was a heroic, home made effort and I enjoyed it hugely. The third place was at The Commander Bar in Notting Hill, where I was utterly charmed by the most magical grotto (in the library upstairs) I have seen – see below. I was even happier because, unlike at all the big department stores, we were the only ones there. So if you are nearby on a Sunday afternoon and fancy seeing Santa in a twinkly wonderland, I can’t recommend it highly enough. No photos from the weekend (have been a bit sick), but today I am wearing a cream/ beige coat (old, from Australia), floral Zara scarf (old), black cashmere Primark cardi (not seen), black Heattech top (not seen, but so vital!) 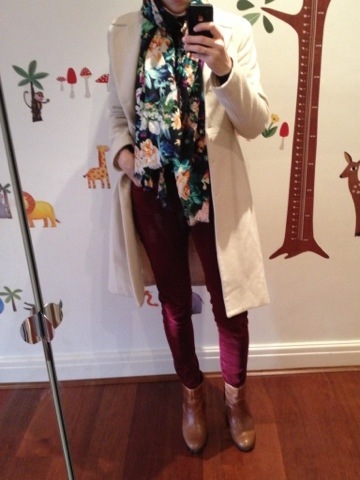 burgundy/wine New Look skinny cords (too tight when I bought them, but now they are quite comfortable. Not an excellent fit, but I still haven’t seen a richer colour. ), tan Mimco ankle boots (old, but the TopShop Anarchy tan boots are a great alternative). 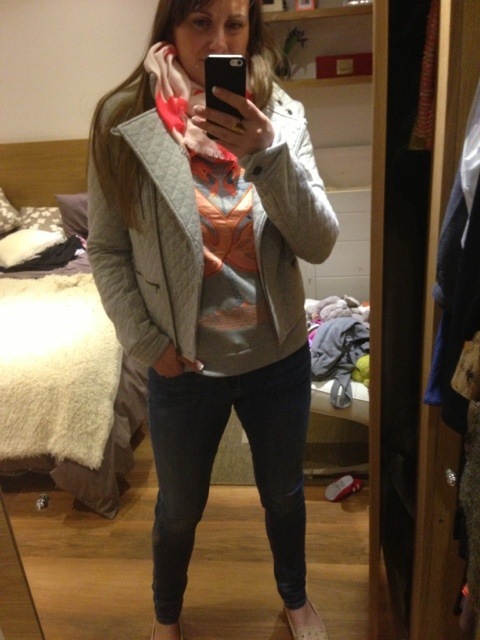 This entry was posted in Children, Outfits, Westfield White City and tagged grotto, Heattech, Mimco, New Look, Primark, Santa, The Commander Bar, Uniqlo, Westfield, Zara on December 10, 2012 by Belinda WornOut. Did I tell you that I like stars? I like jeans too so was very pleased to see my favourite pattern make its way onto denim a few seasons ago. 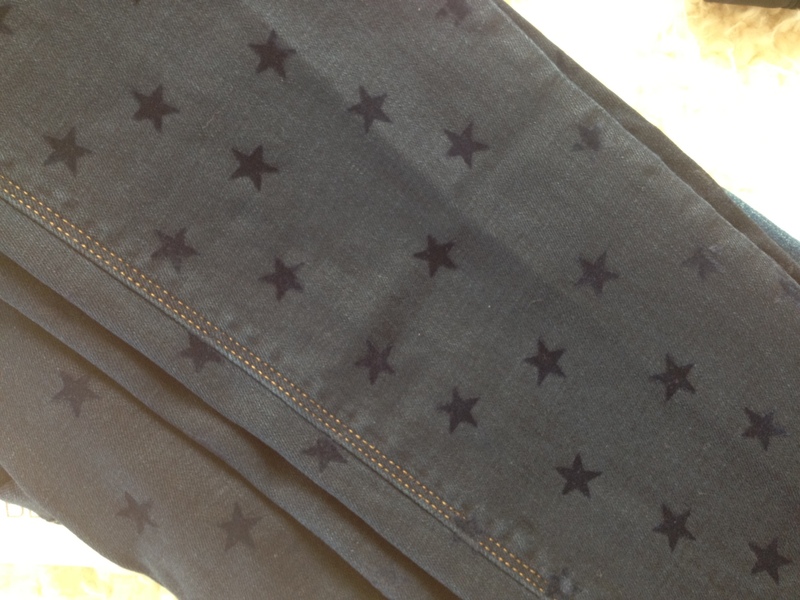 I tried the Current/Elliot star jeans and the J Brand ones too when they came out but being pregnant I couldn’t check the fit properly and ended up returning them. Tracey has a pair of the J Brands she looked great in this summer which made me want some even more. So I was very pleased today when I spotted some on the High Street (well, in Westfield) These Zara jeans are quite a dark denim and will do nicely for winter at a fraction of the premium denim price. The stars are a velvet material. If you are ordering on line it might be worth bearing in mind that I had to size up and they are still very “fitted”. 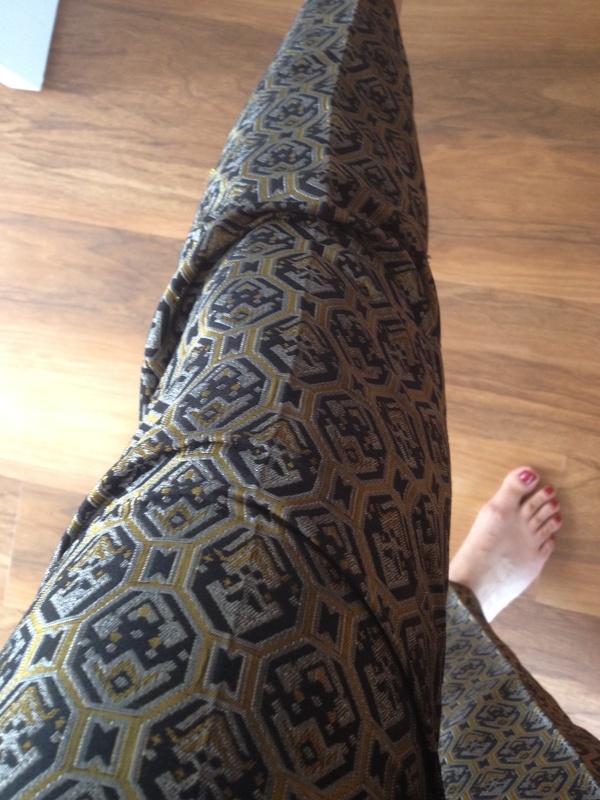 I have been lusting after these Zara brocade trousers for a while. I saw them on line and made a mental note to try on next time I was passing a Zara (as if I ever pass by a Zara) I of course forgot my mental note but shopping with my keen eyed dad yesterday he spotted them and said they looked like me (well, not like me but you know what I mean) I am usually more extreme in my trouser choice – skin tight or harem baggy – but there is something about these trousers that I love. I am a big fan of roll necks (more on them soon) and plan to wear my brocades with a black roll neck and pointed heels. 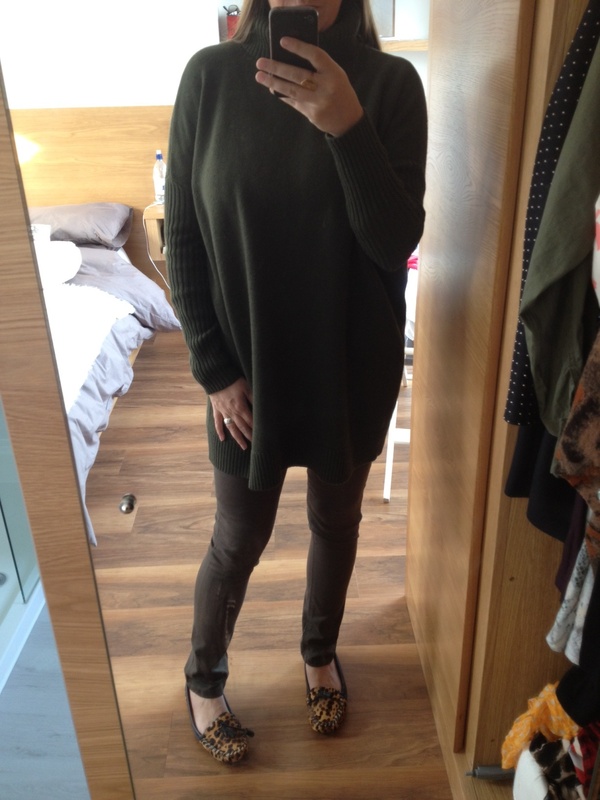 Today for shopping I wore Baukjen Gemma boxy jumper in olive, Zara waxed jeans in olive (I can’t find them on line but highly recommend), and old Zara leopard print loafer slippers. 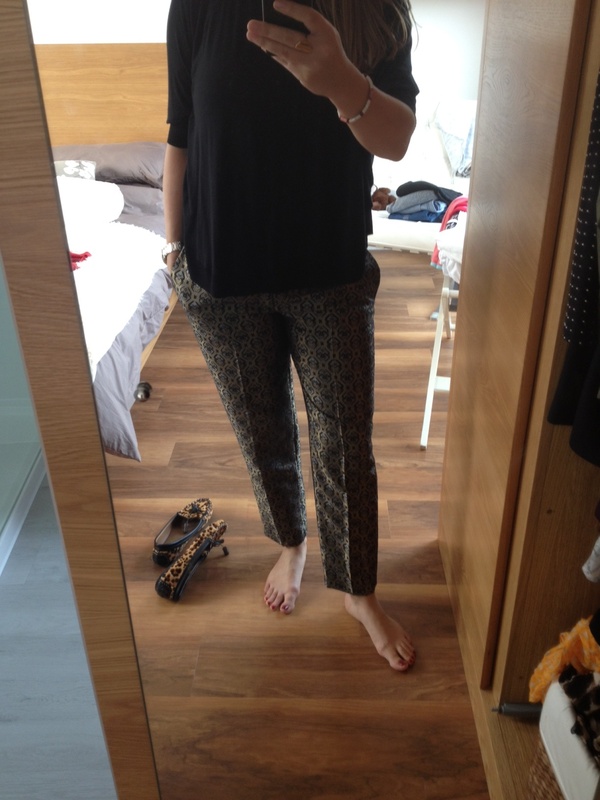 This entry was posted in Ash, Baukjen, Current/Elliot, J Brand, mango, Outfits, Uncategorized, Westfield Stratford, Zara and tagged brocade, stars, Westfield on October 25, 2012 by Eve WornOut.